The SupaDog Rescue League, sponsored by Burgess Pet Care, has now been running for around eight years which is a testament to its success, along with the enthusiasm of the competitors, the organiser Karen Fuller and all the helpers who have done an outstanding job in putting the finals together. Sean Clinch was, therefore, delighted to be asked to be this year’s judge especially since, in the past, he had run two dogs in the Finals. 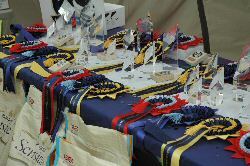 This year the Finals were hosted by Chipping Norton DTC at their KC Open Show on Sunday, 9 June 2013 as part of the Summer Weekend held with Bitz 'n Bobz. I was really looking forward to judging there. From a judge’s point of view, it was nice to see everyone in good spirits and smiling ... even after being eliminated! I think this makes a great difference to all the dogs and competitors and also helps make judging a pleasant task, as it should be. It was nice to hear the commentary on all the rescue dogs as they ran around the course, although I had to concentrate on judging, so only heard part of it It is sad to hear some of the stories, but also heartwarming to know that these dogs have all eventually found happy homes with the additional outlet – Agility, and they were all a credit to their owners. 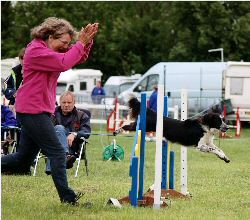 The standard of handling was particularly high which is no mean feat when you consider that most of these dogs have come to agility late in life and that a lot of behaviour issues would have needed addressing before any serious training could take place. The weather on the day was fairly cool, especially after we had been blessed with a few days of glorious sunshine beforehand but, all in all, that was probably a good thing and better for the dogs. The Final itself started with the Medium G4-7 which was won by Helen Anderson and her Kelpie Demon and that was even after a slight deviation towards the A-Frame so well done Helen! The morning continued with Tania Bull and Logan's Run winning the Small G4-7. Then Helen Veal and Wood Greens Red Devil went on to win the Large G3-4 with a paw perfect run. Stephannie Shann finished the mornings competition with Wiccaweys Buddy Marvellous, by winning the Large G5-7 by an impressive margin of 3 seconds. After our lunch break and time to reflect on the morning, it was onto the afternoon courses with the Large Grade 1, Large Grade 2, and the Small and Medium G1-3; starting with the Large Grade 1 where Caroline Durrant ran Bobby with an impressive round to win. For me, the most exciting class of the day was the Large Grade 2 where the lead kept changing hands. It was eventually won by Alison Williamson and Chilli Peppa at Willowyarde, wining in an unbelievable time of 26.99 sec - a Grade 7 dog in the making. Shirley Carton was 2nd with a time of 30.94 seconds. On any other day that would have been enough to win. Janette Weatherley and Rolo Coaster won the Medium G1-3. After qualifying in 2012, she broke her ankle the day before last years finals, so she was very, pleased to take the winning spot this year with her lovely Spaniel. Samantha Kable and A Lola Trouble won the Small G1-3 with another great run - an impressive finish to the finals day. 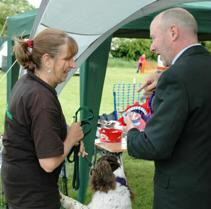 All in all, it was a great day with everyone in great spirits and the sponsors Burgess Pet Care, provide treats and a keepsake for everyone who has qualified, so prize giving is quite a lively, busy affair, with everyone cheering and supporting each other. Congratulations to everyone who qualified and to all the winners. There are some amazing rescue agility dogs out there. So if anyone is out there musing about joining the Rescue League. I would definitely recommend it, as the Final is one of the best days on the agility calendar and, if you’re ever invited to judge, the same applies.